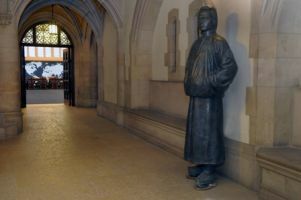 In 1854, Yung Wing (simplified Chinese: 容闳; traditional Chinese: 容閎; pinyin: Róng Hóng; November 17, 1828 – April 21, 1912) became the first Chinese student to graduate from a North American university. 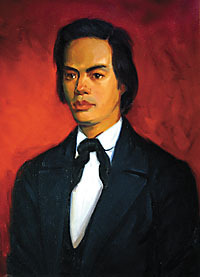 A native of Guangdong Province, Yung excelled in his studies and impressed Samuel Robbins Brown, a Yale-educated missionary, who brought him to the United States for preparatory school at Monson Academy and then sent him to Yale in 1850. At Yale, Yung Wing was a member of the choir, played football, was a member of the Boat Club, and won academic prizes for English competition. Inspired by and determined to share his experience at Yale with other Chinese students, Yung organized the Chinese Educational Mission. Over a decade, he sent 120 Chinese students to schools in the United States, including Yale. These alumni of Yale returned home to become leaders in fields such as engineering, diplomacy, and academia, including Zhan Tianyou, known as “the father of China’s railroads,” and Tang Guo’an, the first president of Tsinghua College, forerunner of prestigious Tsinghua University. Yung went on to fulfill his calling as an educator and diplomat. He worked tirelessly to improve relations between China and the United States throughout his life. In 1876, Yale awarded Yung an honorary Doctorate of Laws. In 1878, Yung donated more than 1,200 volumes from his collection, books that became the core of Yale’s world-renowned East Asian Library. Shortly after, Yale appointed the first professor of Chinese civilization in the United States. The relationship between Yale and China is both historical and intimate and its shared vision of education can be traced back to the work of Yung Wing.